I tend to suffer from tiredness and fatigue due to working two part time jobs, running a home and a family, I normally left feeling pretty exhausted, but I know I'm not alone. Berocca recently carried out new research that reveals the UK is increasingly becoming a nation of recluses with low energy levels causing nearly half of people to miss out on new experiences, of the 2,000 people surveyed, 1 in 4 feel too tired to spend time with family and friends. Most of us view tiredness as their number one health concern, so The Berocca Energy Report was launched to encourage Brits to look after their own energy and fatigue levels, so they can be ready to embrace life’s opportunities. 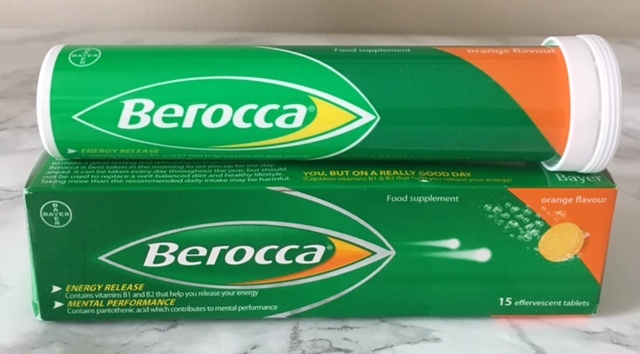 I have used Berocca before as it was recommended by a friend, the great thing is that I actually felt that Berocca did make a difference in the way I felt, but after a while I stopped taking it as I felt good, but of course I just fell back into the same routine as I was prior. So I'm now pleased to back to starting each day again with a Berocca. Berocca is packed full of 8 energy releasing B vitamins and other essential nutrients which are scientifically proven to help support energy release and help with mental performance, and you can take it every day simply by dissolving one of the four delicious effervescent Berocca tablets in water, but if you don't like effervescent Berocca also have easy to swallow tablets. For more information visit Berocca.co.uk, Twitter (@BeroccaUK) and Facebook (@Berocca).